“Remember how things used to be? Why can't they be like that any more? Because, no matter how much you may claim to hanker for a repeat, things have moved on. When we pine for the past, we confuse the experience we had with the events that triggered it. Imagine being hungry and dreaming of a dinner you ate some years ago. You don't want THAT dinner. Even if there's any left, it has long since rotted! You want something similar, freshly cooked. If it is new, though, it will be different. Be inspired by the past, but don't be a slave to it.” – I don’t generally read my horoscope, but this is what Jonathan Cainer had to say about me (and one in twelve other people) this week. Naturally, with it being about food, I took note. 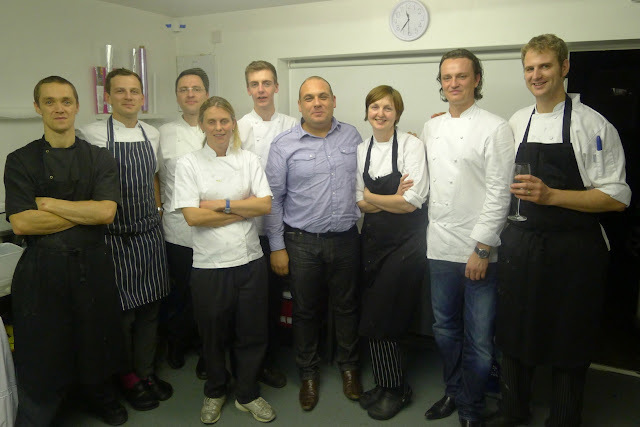 For me, ‘THAT dinner’ would be the meal I ate, just over a year ago, at The Fat Duck. 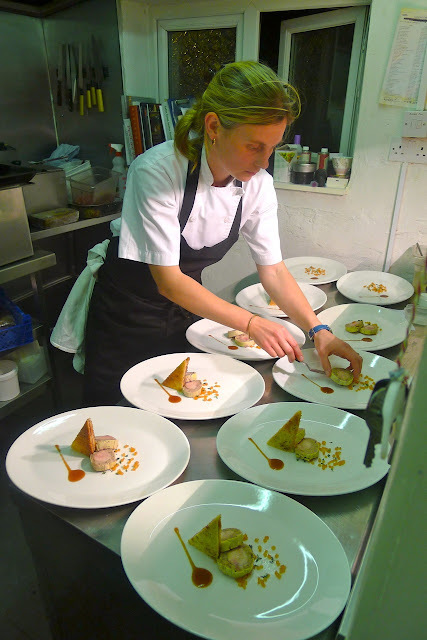 When telling people about my meal there, I usually start by saying that, once I had secured a booking, I was a little apprehensive about going; knowing that I had built it up so much and had such high expectations, I was worried that it wouldn’t live up to them… it surpassed them! I also tell people that eating there is a ‘once in a lifetime’ experience and that they should do their upmost to secure a table. That ‘once in a lifetime’ experience is one I have since dreamed of repeating – and haven’t even got close to in any other restaurant, even those with a similar three Michelin stars. 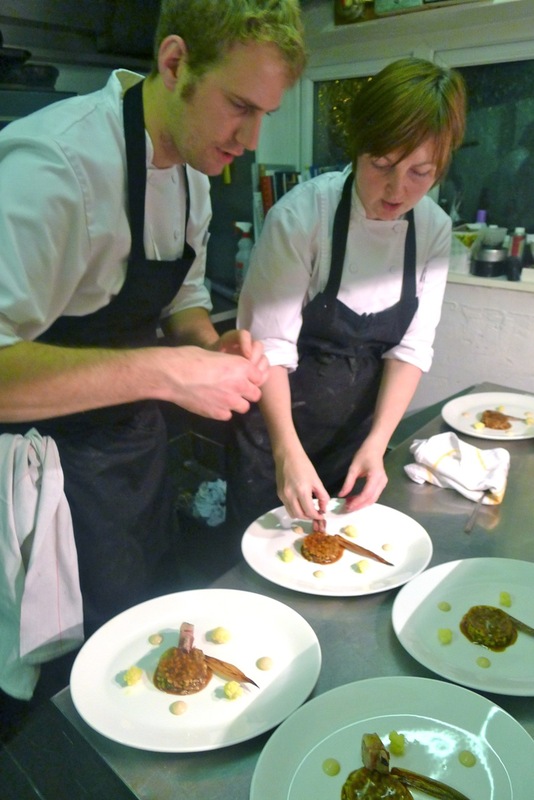 Mary-Ellen McTague and her husband Laurence Tottingham of Aumbry worked at Heston Blumenthal’s multi-award winning winning Bray bastion for four years - and as part of the Manchester Food and Drink Festival managed to reunite a select ‘paddling’ of Duck alumni as well as Jonny Lake (the current Head Chef) and James ‘Jocky’ Petrie (Head of Creative Development) to cook a ten course charity banquet in aid of the worthy cause, Hospitality Action & the Royal Manchester Children's Hospital. The other former Ducks gracing Aumbry’s quaint little restaurant tucked away on a quiet side street in the village of Prestwich were later confirmed as James Lowe of the London based culinary trailblazers The Young Turks and Heston’s former sous chef Emily Watson, recently celebrating another year as a holder of a Michelin Bib Gourmand at her Oxfordshire Inn, the Kingham Plough. 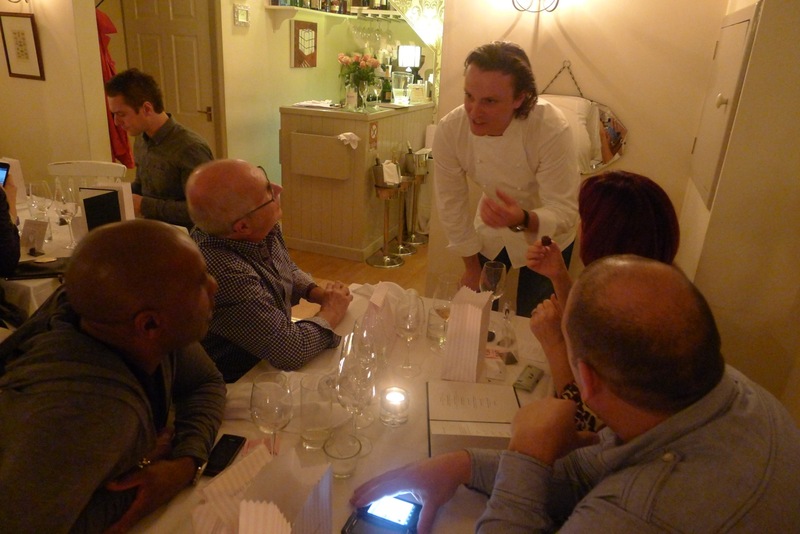 Aside from having the opportunity to eat Emily’s and James’ food for the first time the most exciting promise was that Jonny and Jocky would be creating dishes from the current Fat Duck menu. Would it be the Licorice Poached Salmon? Snail Porridge? 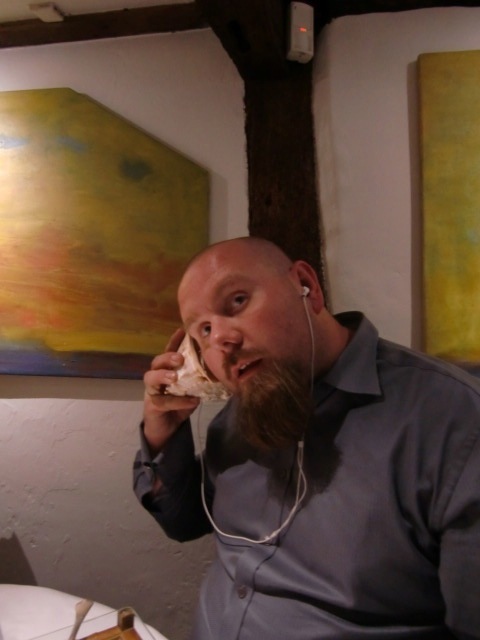 Sound of the Sea, complete with iPod and conch shell? The Alice in Wonderland inspired Mock Turtle Soup? What about the desserts… The ‘BFG’? or perhaps Like a Kid in a Sweet Shop? I have eaten them all before and despite what my “stars” said I would happily eat them all again, and again, and again! Guests lucky enough to have secured the hottest ticket in town were instructed to arrive at 7pm. Upon arrival we were ushered into Aumbry’s retro lounge where a free flow of Deutz Champagne and tasty appetisers got the party started. 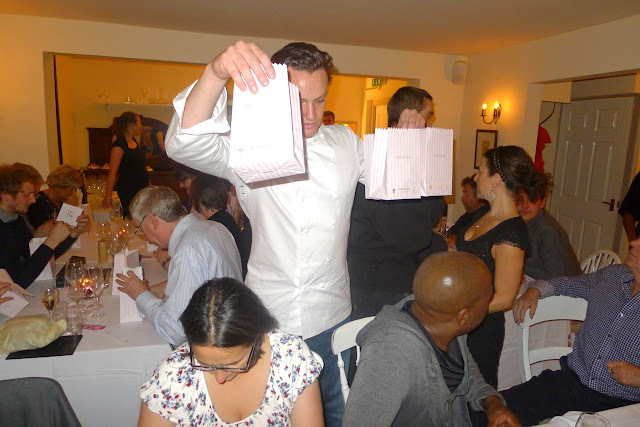 There was a palpable excitement in the air which was elevated further when the evening’s menu was revealed - the answers to my questions? The Sound of the Sea and Sweet Shop… get in! 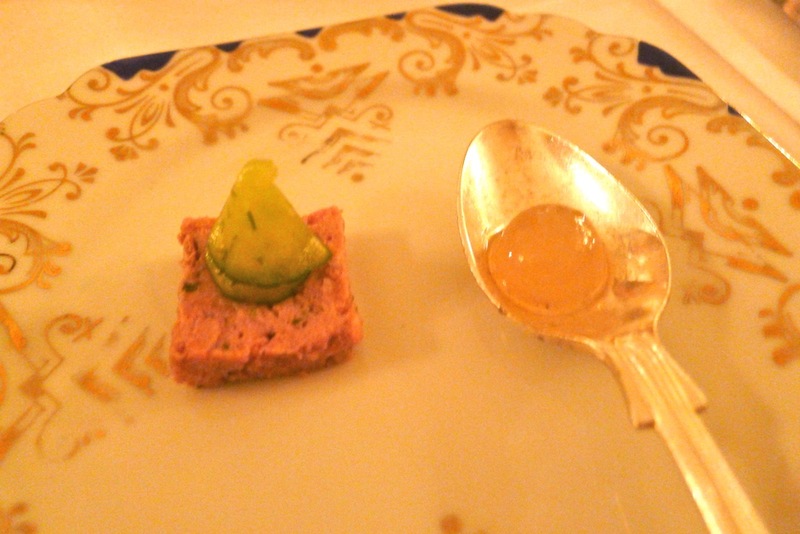 The Pork Paté with subtly Pickled Cucumber and a fragrant spherification of Jasmine & Honey - a wonderful amuse bouche served on their customary vintage tableware. 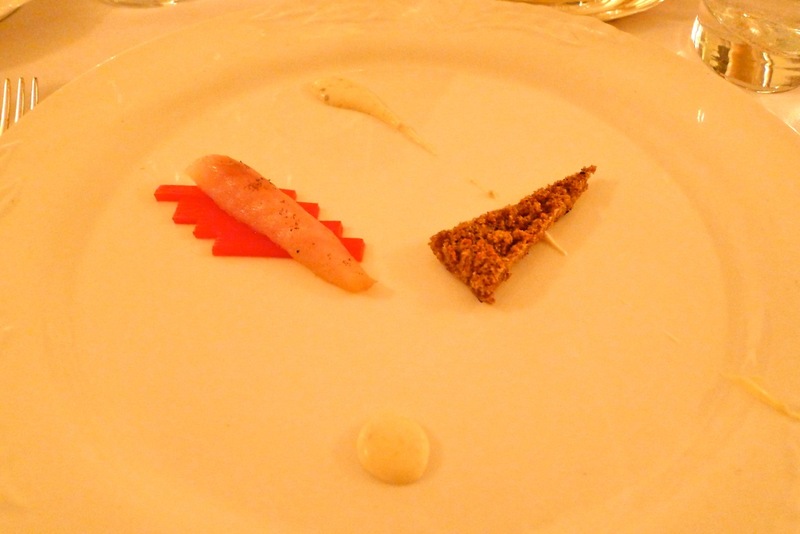 Followed by their amazing Home Smoked Mackerel with Poached Rhubarb & Mustard Cream – superbly subtle smoking. Next up came the first of the ‘guest chef’ dishes, Emily Watkins’ Ballotine of Partridge with Pickled Quince, Partridge Consommé & Quince Brioche. 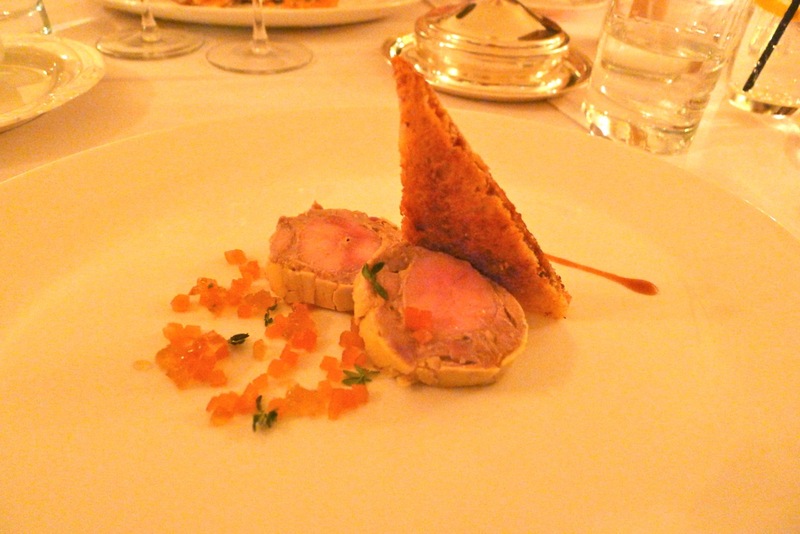 The Partridge meat was as flavoursome as any I have had and the richness of the consommé and parfait on the terrine were balanced beautifully by the quince garnishes. Very accomplished cooking. 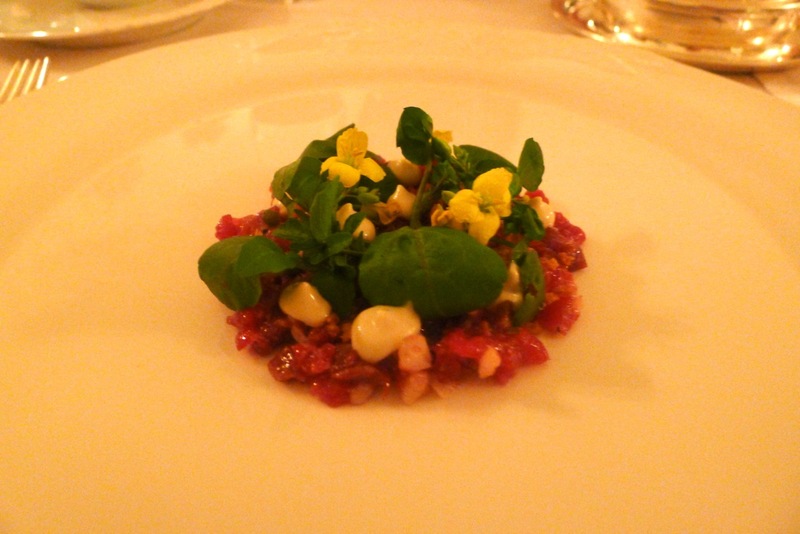 The next course was James Lowe’s Raw Hereford Rib with oyster & wild watercress - a deceptively simple dish with phenomenal flavour, stunningly and colourfully presented with wild watercress and peppery rocket flowers. The well-hung raw beef served in a small dice (as opposed to minced) had bite and good flavour, helped by the fact that it was not direct from a chiller. Delightfully crunchy breadcrumbs, fried in dripping provided texture and the pickled elderberries added acidity and a further tart burst of zinginess when they popped in the mouth. 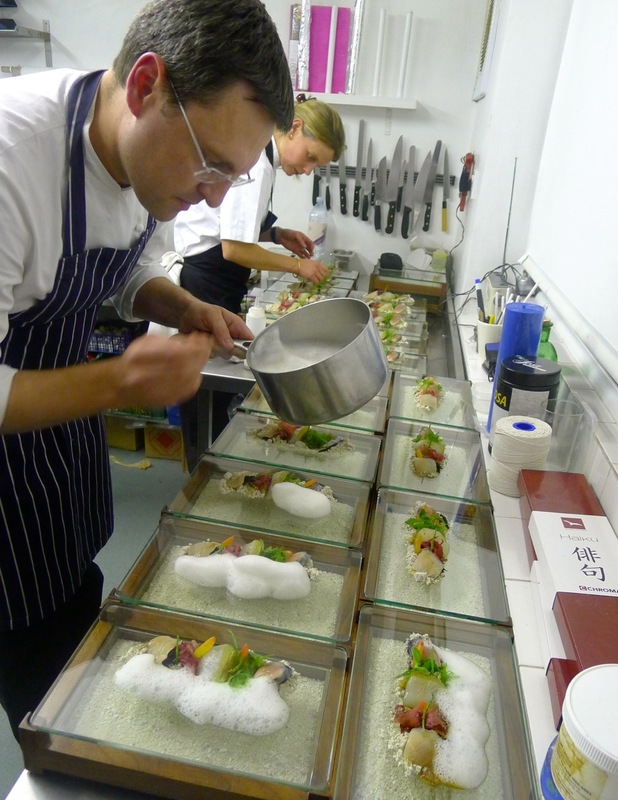 The oyster emulsion was sensational, inventive and ingenious – most importantly, it tasted great! The visiting chefs had given up their time to travel, cook, be reunited with and support their friends at Aumbry. Throughout the evening it was pleasing to see them helping out prepping, plating up, tasting and asking questions about each others’ dishes. Chefs at the top of their game, who despite training and working at some of the world’s best restaurants still have passion, hunger and humility. 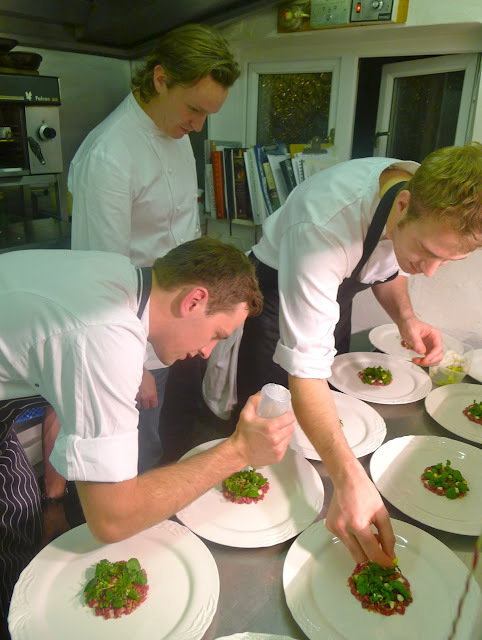 Between some of the courses I made my way into the kitchen to watch these masters of their craft at work. There were no big egos and every one of them was happy to answer questions, share experiences and their love of food. Of all the chefs, I probably spoke to James Lowe the most - a gourmet go-getter with a glittering future; who, along with his fellow Young Turks, has a refreshing philosophy to food and ‘restaurants’ in general. As well as the Fat Duck, he has also worked at Noma, WD-50, the River Café and spent close to fours years as the Head Chef at St. John Bread & Wine. Each of these places having clearly influenced his food. James was telling me about their plans to open a three-month long extended ‘pop-up’ at The Ten Bells, pub in Spitalfields (famous for its Jack the Ripper connection) in London’s increasingly modish East End. With the menus changing weekly, reservations may be hard to come by. If you’re hearing this news here first, keep an ear to the ground so that you don’t miss out… you’ll be treated to amazing food by an inspiring talent. Up next, the dish I had been waiting for, the Sound of the Sea. Jonny Lake, the Canadian Head Chef at The Fat Duck was overseeing this dish’s creation (for the first time outside Bray), although all hands were on deck to help. 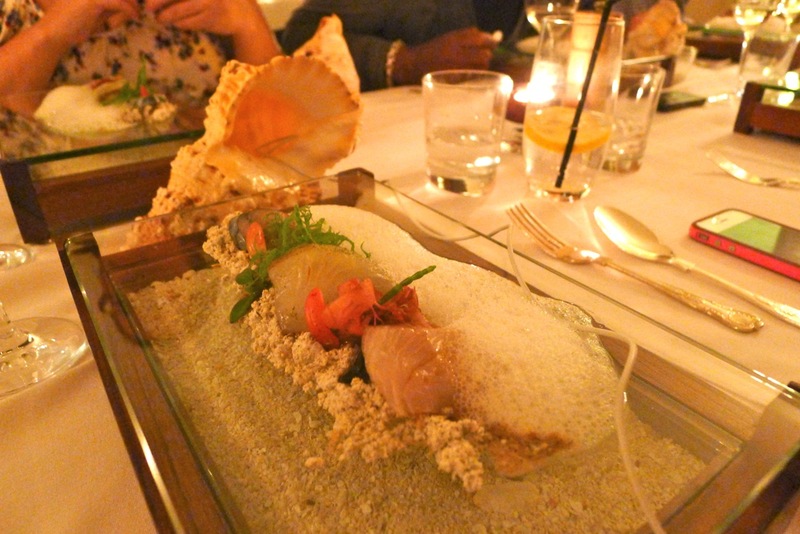 Presented on a handsomely crafted wooden podium with a glass plate set above a seabed of sand; the dish itself consists of a sashimi of succulent seafood, served with a selection of seaweeds, edible sand, miso and a foamy breaking wave. Exquisite! (At The Fat Duck) I thought it was a gimmick too. Then I plugged in & tasted it! Many people I’ve spoken to about this dish believe that listening to an iPod, nestled in a shell, playing the sound of crashing waves and cawing gulls is nothing more than a gimmick. In fact, Heston worked with Oxford University to experiment with how sound can enhance the sense of taste. Stating, "We ate an oyster while listening to the sea and it tasted stronger and saltier than when we ate it while listening to barnyard noises, for example." That definitelty sounds like a fun thing to study! 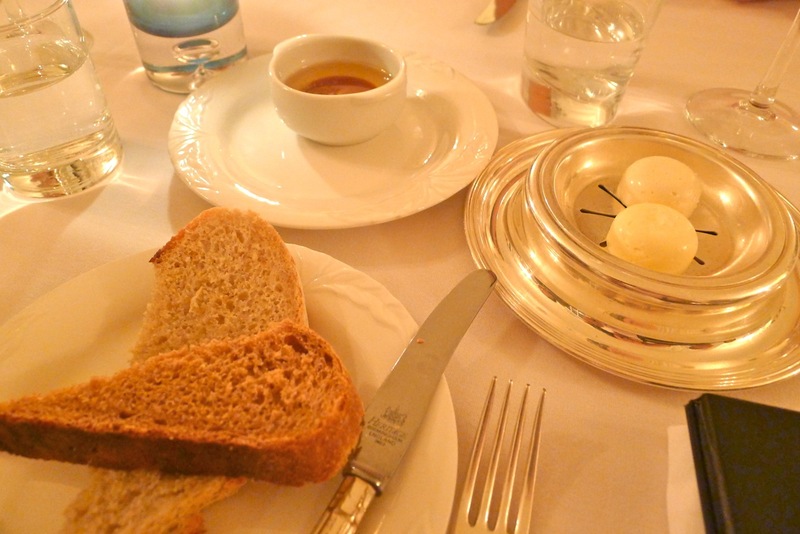 The real test for me is watching the change in diners reactions: when at the Fat Duck I noticed that people would laugh and joke upon being presented with the shells (as the photos of me prove!) 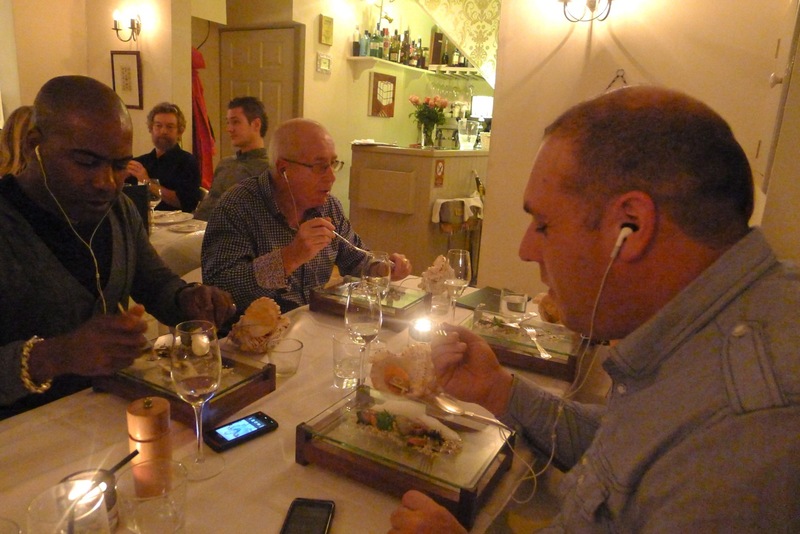 but as the food arrives slowly a change and calm invariably comes over them as they ‘get into it’ – the same thing happened here, as you can see with my fellow guest Ray and Franco. Mary-Ellen and Laurence had a tough act to follow… but Manchester’s ‘Chef(s) of the Year’ at this year’s Food and Drink Festival had an ace up their (rolled up) sleeves - their Slow Cooked Herdwick Lamb may not have had the theatrical elements and Apple gadgetry of the previous course but what it lacked in this area, it more than made up for in depth of flavour. 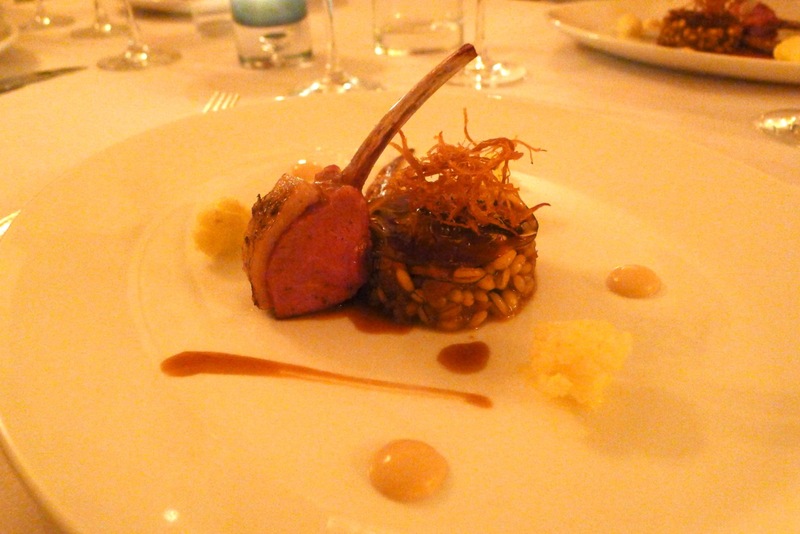 The rich pearl barley topped with a disc of Maderia gelée was stunning. The cauliflower, smoked shallot and crispy shallots adding further flavour and great textures. 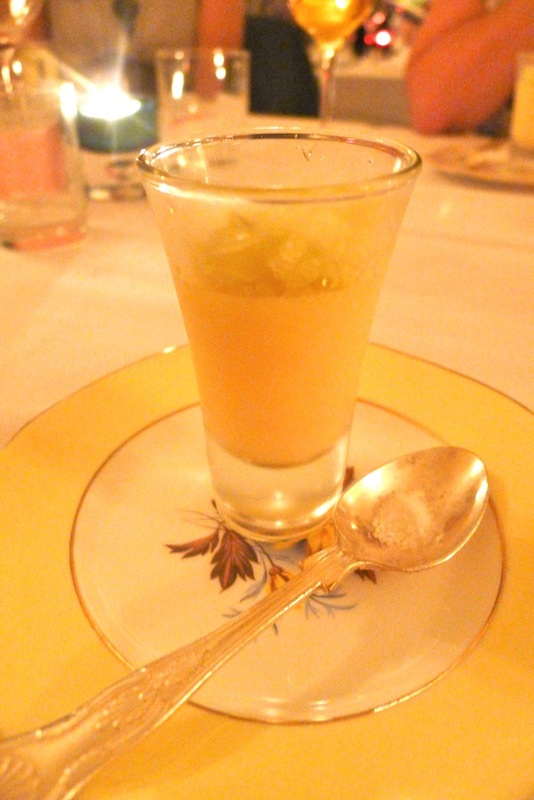 Aumbry’s popular pre-dessert, the Grapefruit Posset with celery granita & sherbet went down well, as usual. 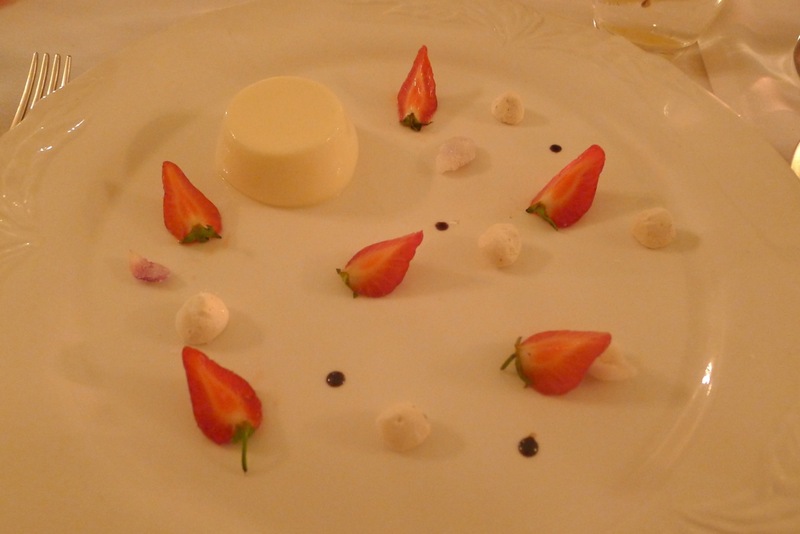 The Hesketh Bank Strawberries from nearby Preston were the stars of the impactful dessert. Tiny meringues, frosted rose petals, dots of peppery sauce and a rose water panna cotta completed the dish. All good things come to an end and the meal ended with all good things – namely, The Fat Duck’s ‘Like a Kid in a Sweet Shop’. 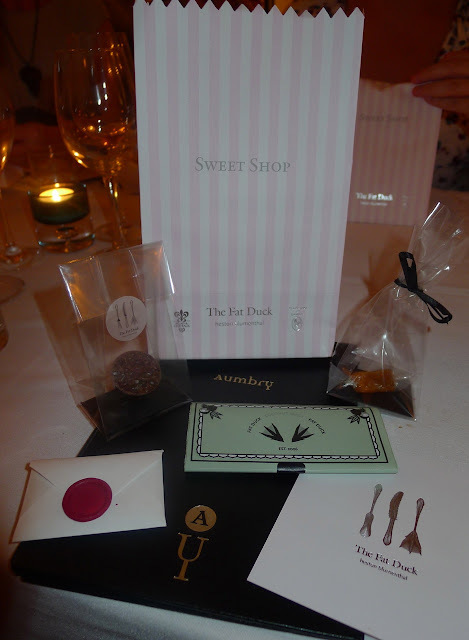 Served in an olde fashioned sweetie shop style pink and white striped bag, containing an Aerated Chocolate with Mandarin Jelly; Coconut Baccy (coconut infused with black Cavendish tobacco) Apple Pie Caramel (with an edible wrapper) and Queen of Hearts (white chocolate with fruit compote.) What made this course all the more special is that it was hand delivered by one of it’s creators, former pastry chef and now head of creative development, James ‘Jocky’ Petrie. James stayed at our table for quite some time, answering questions and generally schmoozing – a real character and a great guy. Sadly, I didn’t get to eat mine as I decided to take them home for my wife to ease my guilt about leaving her at home, missing out on the most wonderful of meals and evenings. The meal may have been over but the evening still had not finished. 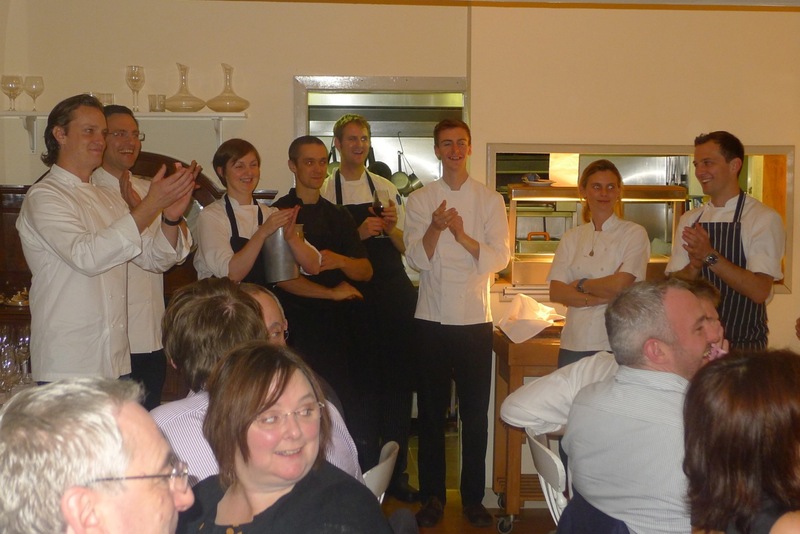 First, the chefs came out to the dining room to our rapturous applause. Each chef was introduced to the diners and thanked by Mary-Ellen; they then drew the charity raffle. One lucky diner won a fantastic type 301 F.A. Porsche Japanese Chef’s Knife donated by Franco, one of the evening’s sponsors. Another won an overnight stay and meal at Emily’s Kingham Plough. More importantly, I won ‘Sunday Lunch for Two’ at Aumbry. It would have been right up your street! Fantastic! I avoided reading before, as my sister announced at my 40th birthday (end September) that she'd be taking the two of us to The Fat Duck. We finally went on Thursday and it was incredible. INCREDIBLE! This meal where you had the chance to enjoy a menu created by FD alumni, sounds incredible, as does the opportunity to pop into the kitchen and watch and talk to the chefs! I spent all weekend writing my experiences up and today I'm catching up on the posts I skipped! Thank you Kavey! It was indeed a special night. Just had a quick look at your post (will have a proper read later) but the pics look amazing! 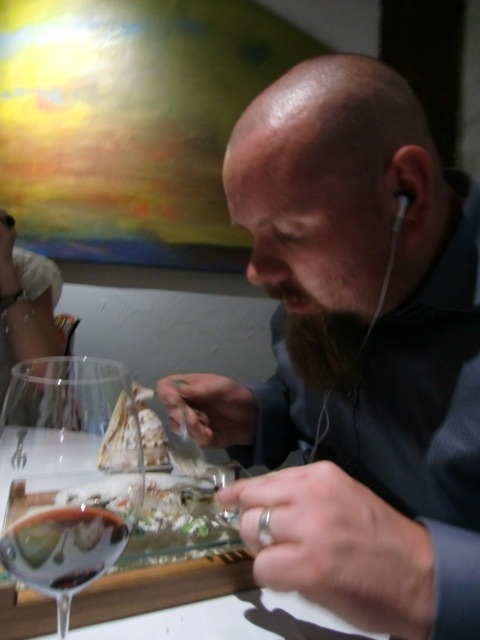 I've been working on my top ten meals ever and still have the top 3 to go, in which The Fat Duck will feature! I'm gonna try and get number 3 up this week!